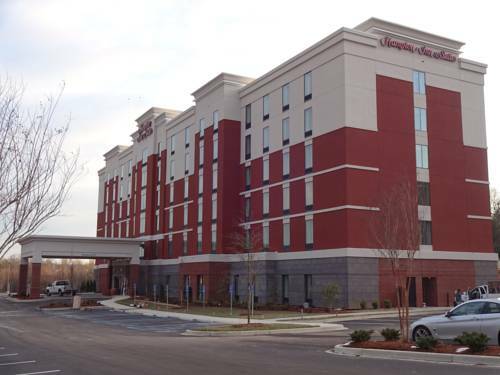 Welcome to Hampton Inn - Suites by Hilton Greenville Airport located just off I-85 and only four miles from the Greenville-Spartanburg International Airport. The hotel is set in the eastside region of Greenville home to historic downtown Main Street and over 40 international headquarters. Make use of our 24-hour complimentary airport shuttle plus free drop off and pick up service within a five-mile radius of the hotel. Our contemporary Greenville Airport hotel offers plenty of amenities to make you feel at home. Spacious guestrooms feature clean and fresh Hampton beds refrigerator microwave free WiFi work desk and extra electrical charging outlets. Select king rooms come equipped with a sofa bed and our suites offer extra space a seating area and a wet bar. Start your day right with our free hot breakfast buffet available daily from 600am to 1000am. Choose your favorite toppings for oatmeal and freshly made waffles to accompany hot and cold selections. If you*re in a rush opt for a free Hampton On the Run Breakfast Bag /Monday to Friday/. There are more than 20 restaurants in the local area make sure to stop by the front desk for an insight tip. Enjoy freshly baked cookies and sweet ice tea served daily in the lobby at 430pm. Refresh in the indoor pool with outside patio or workout in our large fitness center. We offer a business center and two meeting rooms with over 1 200 sq. ft. of space for your next Greenville SC meeting or event. Bulldog-themed watering hole known for wings pizza - beer plus hosting trivia - karaoke nights. Southern Barbecue Sandwiches and Plates. - Michelin North America Inc. There's not much eternal rest going on here.